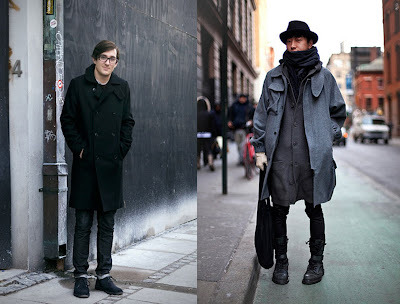 Yesterday I was promising a wee street style post because too much time passed by without a breakdown. So here are some of the looks I've been gathering from various street style sites either because they are well thought of, or simply because of their quirkiness. Remember to click for bigger or follow the links where the respective article was originally posted. I'll start off with the girls and first comes a Balenciaga ensemble, which appeals too me with the kind of bad-girl attitude. What the next girl has on caused quite a stir. 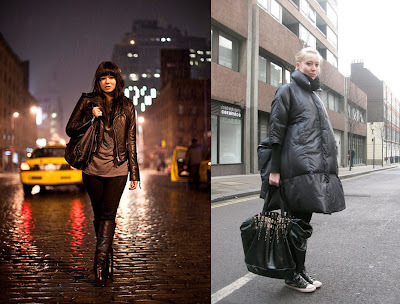 In the comments sections, people were calling the look either garbage bag chic, or hot air ballon... Some noticed the bag, some noticed the coat, some hated it and some loved it. Then guessed it's warm. I suppose they could be right with the last one, haha. Now if you ask me I won't even comment on the coat. What I think it's special is that the girl was smart enough to pair the two controversial items she has on with a pair of sneakers. Touché! The boys are even more edgy than the girls. I've tried to split the four looks two by two: naughty and nice. Haha. 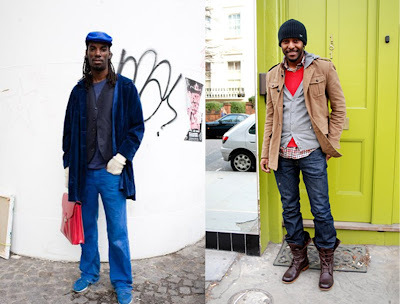 No, actually there are all examples of casual looks, but with a twist. The second guy in the first photo is Jin Ok, a designer from Asia. The grey coat he has on is selfmade. It fits in his rather quirky style. The guys in the second photo both show some interesting layering patterns and a particular way of mixing colors.